Ah, yes. More on the fresh summer produce from New Jersey farms! This time, we took a trip to Emery's Berry Farm in New Egypt, New Jersey. Known for their organic blueberry crop, and with the extra warm weather bringing picking season a little early this year, we wanted to be sure to get out there before all of those beautiful blueberries were gone until next summer! While the farm stand is open daily from 9-6, picking hours are only from 9-4. (We made this mistake on our first attempted visit! We did, however, score six blueberry donuts and one ah-may-zing "Trifecta" pie: blueberries, cherries, and peaches, HELLO. Still a winning trip.) Still, the best thing to do would be arrive first thing: that summer heat is no joke! Tough rule, but it makes sense: I for one could stand around eating blueberries all DAY LONG! Not sure if there's any hard and fast rule regarding it, but my picking experience leads me to the following: the bigger and bluer, the better. Pretty obvious, right? Some of these berries bordered on deep purple, nearly the shade of ripe blackberries: SUPER sweet! 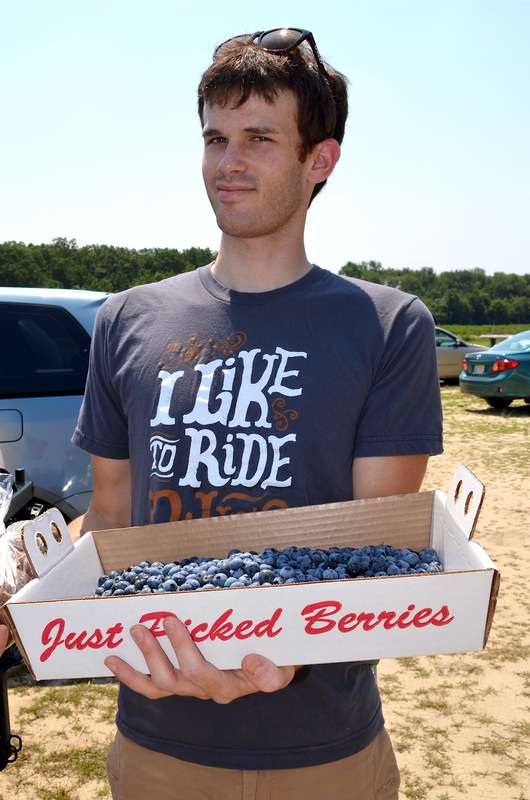 Cute Colin, my adorable picking partner, and sweetie-pie sport, endured nearly thirty minutes of blazing hot sun while we gathered organic berries, perfect for breakfast, dessert, or a healthy sweet snack! For one hot July afternoon, I think we did alright! We tried to split our bounty evenly, though the truth is not much of my half made it home! Too, too good.